Freshman Kayla Mershon produced a career high with eight points off the bench and helped Nebraska out-rebound No. 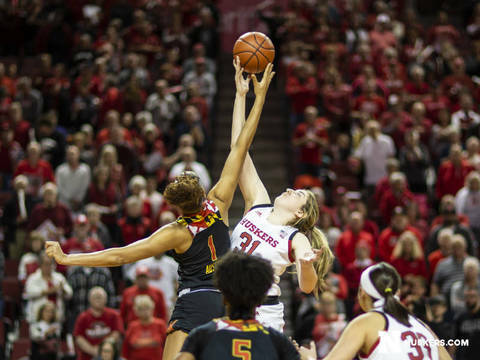 9 Maryland for the game, but the Terrapins used hot shooting to post an 81-63 women’s basketball win over the Huskers on Tuesday night at Pinnacle Bank Arena. Maryland improved to 14-1 overall and 3-1 in the Big Ten while giving Coach Brenda Frese her 500th career victory. Nebraska slipped to 7-8 overall and 2-2 in the conference. The Huskers also saw their five-game home winning streak come to an end. Mershon, a 6-3 forward from Chanhassen, Minn., produced eight points on 2-of-3 shooting from the field including a three-pointer to spark the Huskers in the first half. She added four rebounds and a steal. Juniors Nicea Eliely and Hannah Whitish led the Huskers with nine points apiece, while freshman Sam Haiby contributed eight points, four assists and three steals against the Terps. Senior Maddie Simon, sophomore Taylor Kissinger and freshman Ashtyn Veerbeek each scored six points, while sophomore Kate Cain pitched in five points and game highs with 10 rebounds and six blocks for the Big Red. Maryland won with consistency and efficiency on the offensive end by hitting 51.6 percent (32-62) of its shots from the field, including a blistering 58.8 percent (10-17) from three-point range. First-team All-Big Ten wing Kaila Charles led four Terps in double figures with 19 points on 8-of-14 shooting, while freshman guard Taylor Mikesell contributed 16 points with four three-pointers. Blair Watson added four threes of her own to finish with 12 points, while forward Stephanie Jones pitched in 13 points on 5-of-7 shooting from the floor. Channise Lewis added nine points and six assists off the bench, while freshman Shakira Austin managed seven points and 10 rebounds for the Terps. While Maryland was firing on all cylinders on the offensive end, Nebraska hit just 37.7 percent (23-61) of its shots, including just 5-of-15 threes. The Huskers were 0-for-6 from long range in the second half, as Maryland pulled away down the stretch. Despite Nebraska’s shot-making struggles, the Huskers went toe-to-toe with the Terps, trailing 45-43 with 5:45 left in the third quarter. Maryland erupted on a 12-2 surge over the next 3:37, and the Huskers never fully recovered. NU cut the margin back to seven at 63-56 with 7:30 left, but a 15-2 Terp outburst sealed Nebraska’s fate. The Terrapins took a 43-37 halftime lead after leading from start to finish in the half. Maryland took its biggest lead of the half at 43-33 with a minute left in the second quarter, before the Huskers scored the final four points of the half. Whitish led the Huskers with nine first-half points, including a pair of three-pointers, while freshman Mershon set her career high by getting seven points in the half. Mershon also added three first-half rebounds and a steal to help the Big Red hang with Maryland. Kissinger hit a pair of first-half threes and grabbed first offensive rebounds in the half. Unfortunately, the Huskers were unable to convert any of the boards into points, as Maryland outscored NU 8-4 in second-chance points in the half. Charles, Jones and Mikesell each scored nine points to lead the Terps in the first half. Maryland hit 51.6 percent (16-31) of its first-half shots, including a blistering 6-of-8 threes (.750). The Terrapins also went 5-of-7 (.714) at the free throw line. Nebraska won the first-half rebounding battle 20-19 and both teams committed nine first-half turnovers which they converted into seven points. The Huskers hit just 39.4 percent (13-33) of their first-half shots, including 5-of-9 threes (.556), while knocking down 6-of-9 free throws. The Huskers return to Pinnacle Bank Arena on Sunday to take on Rutgers. The Scarlet Knights are receiving votes in both national polls and were unbeaten in Big Ten play entering Tuesday night’s action. Tip time between Nebraska and Rutgers is set for 2 p.m., with tickets on sale now at Huskers.com.